and we have some early details on what will be found at retail for this as well as Donruss. at retail 24-pack boxes, blaster boxes and fat packs. Standard boxes ($2.49 per eight-card pack suggested retail price) will come in 20-box cases. Meanwhile fat packs (12 per box) will be $4.99 and include 30 cards. a 10-card set focusing on the career of Kobe Bryant. Class of 2017, Swat Team, Zero Gravity as well as Lights, Camera, Action. and Gold Great SIGnificance autos (/10). and Rookie Remembrance Prime (/25 max). Fat packs will have Teal Explosion cards and Orange Explosion cards (/75). Dernière modification par Eyeshield21 le 08 juin 2018, 11:30, modifié 5 fois. Dernière modification par Eyeshield21 le 08 juin 2018, 11:30, modifié 6 fois. Dernière modification par Eyeshield21 le 08 juin 2018, 11:30, modifié 1 fois. The Basics: The first cards of NBA rookies will be found here with three formats at retail — 24-pack boxes, blaster boxes and fat packs. and veterans as well as a 10-card set focusing on the career of Kobe Bryant. will be Faces of the Future, Class of 2017, Swat Team, Zero Gravity as well as Lights, Camera, Action. Parallels will include Blue Checkerboard (/75) and Red Checkerboard (/15) and Gold Great SIGnificance autos (/10). One of the most anticipated NBA Draft classes in many years is just about ready for its collecting closeup. and more will headline a banner collecting season that begins in earnest on October 25.
welcoming array of attributes that have long made it the quintessential way to start the NBA collecting season. will deliver two autographs and a whopping 24 inserts or parallels. Additional highlights of 2017-18 NBA Hoops Basketball include . . .
- Hot Signatures Rookies and Red Hot Signatures Rookies (numbered to 25). from the first round through the Finals. - Also look for a special Kevin Durant Finals MVP card that rounds out the set and is numbered to just 99. - each insert has Artist Proof (numbered to 25) and Gold (numbered to 10) parallels. with a 10-card subset featuring some of the greatest moments of Kobe’s career. and the latest installment of a hobby favorite is going to hit hobby shops and retail outlets just as the new season begins. with plenty of variety in every box. Markelle Fultz, and Jayson Tatum, there is a lot more to enjoy as you rip open packs. of players beyond those in a starting role. some of them could heat up nicely in the early stages of the season. this year’s design is going to look sharp with different borders. and limited Orange Explosion parallels, the latter of which are numbered out of 75.
from the final release as the sample images show the players in Summer League gear. and features the very first rookie cards for the top names from the 2017 NBA Draft, including Lonzo Ball. with choices like Artist Proof, Artist Proof Black, and Gold. Blue (#/75 - Retail), Orange Explosion (#/75 - Fat Packs), Red (#/49 - Blaster), Orange (#/25), and Red Checkerboard (#/15 - Retail). for collectors that want to try building a small themed set. Courtside, We Got Next, Special Delivery, and Back Stage Pass. or Gold (/10) parallel to track down. or fat packs will include Zero Gravity, Swat Team, Faces of the Future, Class of 2017, and the popular Lights, Camera, Action. and 15 other teams took in the quest for glory. Each of these cards is serial-numbered as well. The set is rounded out with a Kevin Durant NBA Finals MVP card (/99), which is a tough pull. a 10-card Kobe Bryant Career Tribute that examines the future Hall of Famer’s career. Also keep an eye open for Shaquille O’Neal 2K Sports inserts. of the "Black Mamba’s" legacy, which is honored with a 10-card set. and contains a rare card for the Finals MVP (#/99). and We Got Next are hobby-exclusive inserts. Parallels add to the chase with Artist Proof (#/25) and Gold (#/10). Faces of the Future, Swat Team and Zero Gravity. and the theme remains constant from previous releases with Hot Signatures and Hot Signatures Rookies. Both sets have a Red Hot version once again and they are numbered to 25.
from the past, present, and future of the game. which could focus on the debut seasons of veteran players. and Hot Signatures Rookies autographs again bring the Red Hot Signatures (#/25) parallel. and Rookie Remembrance relics are exclusive to blaster packs. These both have Prime parallels limited to 25 copies or less. of a new year as the popular brand returns for another season. with three formats at retail — 24-pack boxes, blaster boxes and fat packs. and Red Checkerboard (/15) and Gold Great SIGnificance autos (/10). Jumbo packs will have Teal Explosion cards and Orange Explosion cards (/75). and there will be 24 inserts per box (one per pack). These will include hobby-exclusive Hot Signatures and Red Hot Signatures (/25) and also cards of each type for rookies, too. Also in the mix will be Road to the Finals inserts, documenting the playoff run of the NBA champion Golden State Warriors and other teams. A Kevin Durant Finals MVP card will be limited to only 99 copies. Other hobby-only inserts will include We Got Next, Back Stage Pass, Special Delivery, Courtside and Team Leaders. Each of these sets will have Artist Proof (/25) and Gold (/10) parallels. The basic cards will include all notables from this year’s NBA Draft with Gold parallels. with a 10 card subset featuring some of the greatest moments of Kobe’s career. - Multiple Parallels – Including Gold, Artist Proof, Black & More! We’ll have plenty more on 2017-18 NBA Hoops in the coming weeks right here on The Knight’s Lance. Dernière modification par Eyeshield21 le 21 juin 2018, 11:55, modifié 7 fois. and collectors on October 25 boasting one of the most stacked rookie crops in several years. and their Rookie Cards — dotting 2017-18 NBA Hoops Basketball’s rookie checklist. from Panini America photographer Michael LeBrecht of each player, too. Enjoy . . .
Dernière modification par Eyeshield21 le 08 juin 2018, 11:31, modifié 1 fois. 2017-18 Hoops Rookie We Got Next DENNIS SMITH JR.
Dernière modification par Eyeshield21 le 08 juin 2018, 11:32, modifié 1 fois. Dernière modification par Eyeshield21 le 21 juin 2018, 12:06, modifié 1 fois. with the tip-off of the 2017-18 NBA season. Next week, the celebrated newcomers — including Markelle Fultz, Lonzo Ball, Jayson Tatum, Dennis Smith Jr.
will help launch the 2017-18 NBA collecting season when Panini America’s highly anticipated 2017-18 NBA Hoops arrives. is poised to be nothing less than a season-opening juggernaut. inserts and subsets including a 10-card Kobe Bryant Tribute set, the returning Road to the Finals, Red Back SPs and much more. at the product showcasing some of the hits that surfaced during the recent packout process. Enjoy the early glimpse and stay tuned to The Knight’s Lance for continued coverage. Si les autos étaient On cards, il ne manquerait pas grand chose pour que ce soit une collection presque parfaite niveau rapport/qualité prix, car les Hoops offre souvent les plus belle photos et situations pertinente immortalisé sur carte toujours laissé dans leur contexte "basket". uppercards a écrit : Si les autos étaient On cards, il ne manquerait pas grand chose pour que ce soit une collection presque parfaite niveau rapport/qualité prix, car les Hoops offre souvent les plus belle photos et situations pertinente immortalisé sur carte toujours laissé dans leur contexte "basket". Complètement d'accord (même si certains choix de photos laissent perplexe, la reg de Durant par exemple...). Rookie Cards featuring the basketball’s brightest new stars are going to be the focus of Panini America’s 2017-18 Hoops. No other basketball brand today has the tradition behind it like NBA Hoops and it is loaded up with plenty of variety in every box. and Jayson Tatum in their NBA uniforms, there is a lot more to enjoy as you rip open packs. in a starting role. More than 40 Rookie Cards are in the mix. The final ten cards act as a tribute to Kobe Bryant and key moments in his career. Parallels come in more than a dozen different versions. Some of these are exclusive to specific pack types. For example, retail jumbo packs have Teal Explosion and Orange Explosion (/75). Special Delivery, and Back Stage Pass. For an even bigger challenge, many of these cards has an Artist Proof (/25) or Gold (/10) parallel to track down. will include Zero Gravity, Swat Team, Faces of the Future, Class of 2017, and the popular Lights, Camera, Action. and 15 other teams took in the quest for glory. Each of these cards is serial-numbered as well. (with a Prime version /25). Rookie Remembrance and its Prime parallels (/25) focus on the debut seasons of veteran players. 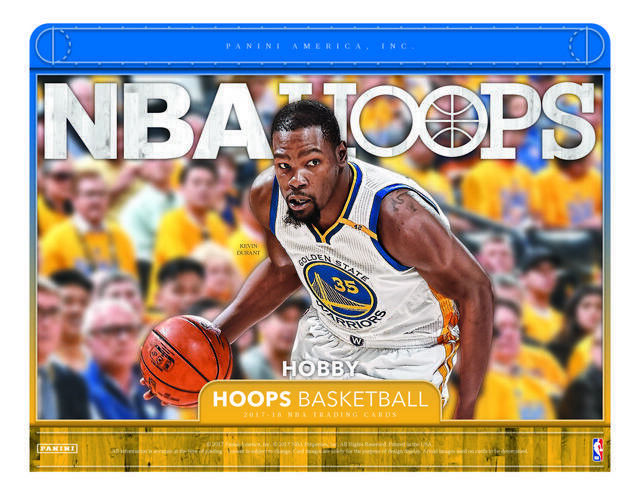 2017-18 Hoops arrives in hobby shops across North America to officially tip off the 2017-18 NBA collecting season. to the season to come. will deliver two autographs and a compelling array of inserts, parallels and Rookie Cards. You can check out a little bit of everything the product has to offer in last week’s Quality Control Gallery. For a pack-by-pack crash course in what two random boxes yielded, check out the Teaser Gallery that follows. Dernière modification par Eyeshield21 le 08 juin 2018, 11:32, modifié 2 fois. 2017-18 Hoops Set Checklist 300 cards, including 10 Kobe Bryant Tribute cards.